We invite you to experience......the perfect candle. Each Tranquil Glow candle is made from 100% All-Natural Soy Wax, with cotton wicks, extended burn times and a high fragrance concentration for the perfect experience. They contain no additives or dyes, and are available in dozens of scents. 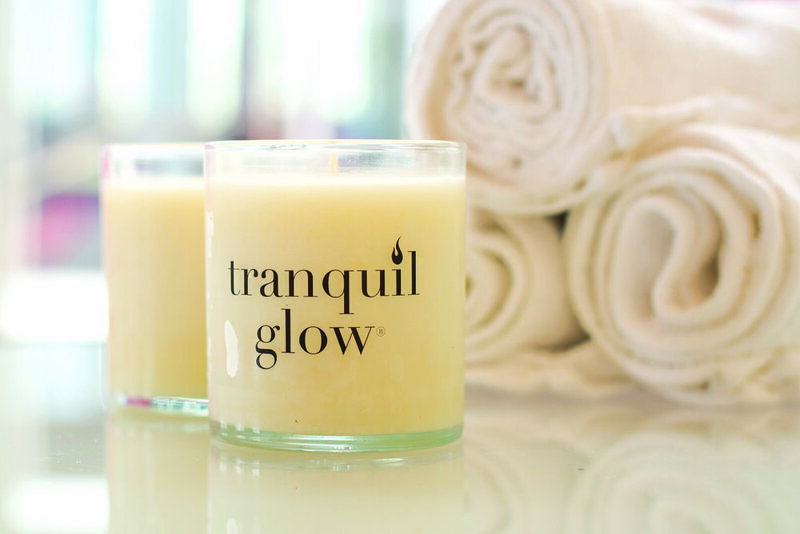 Whether you are looking for round traditional jar candles, square jar candles, aromatherapy candles, wickless "tarts" or unique scents like those in our Wine Collection, the Tranquil Glow collection is guaranteed to become your new go-to favorites. Choose from 16oz or 24oz traditional round jar candles, or 10oz. square jar candles in a wide variety of scents including Dreamsicle, Cinnamon Buns, Mulled Cider, Fresh Linen and many many more. 16oz. round candles feature a 40+ hr burn time, 24oz. round are 66+ hrs, and the 10oz. square are 26+ hours! All jar candles come in white soy wax to compliment any decor! The Tranquil Glow aromatherapy sets contain 2, 9oz. round jar candles for mood-enhancing atmospheres and relaxation. They feature 100% all-natural soy wax with high fragrance concentrations, and come in perfect scented combinations like Bergamot/Grapefruit, Orange/Ginger and Sage/Citrus. Our wickless Tart Melt Collections melt quickly to produce room-filing fragrance in minutes. We offer three exquisite scented collections including Holiday Memories, Harvest Time and Spring Time Breeze. Each collection contains 3, 4oz bags that work in all electric and non-electric warmers. Our unique Wine Collection scented candles combine the delicate aromas of fine wine with subtle blends of exotic spices, natural fruits and more. Experience the soothing aromas of Pinot Noir, Cabernet, Chardonnay or White Zinfandel while relaxing at the end of the day or watching the sun set on the horizon. Thank you! Someone will be in touch within 48 hours! ©2017 Tranquil Glow Candles/Hansen Foods.